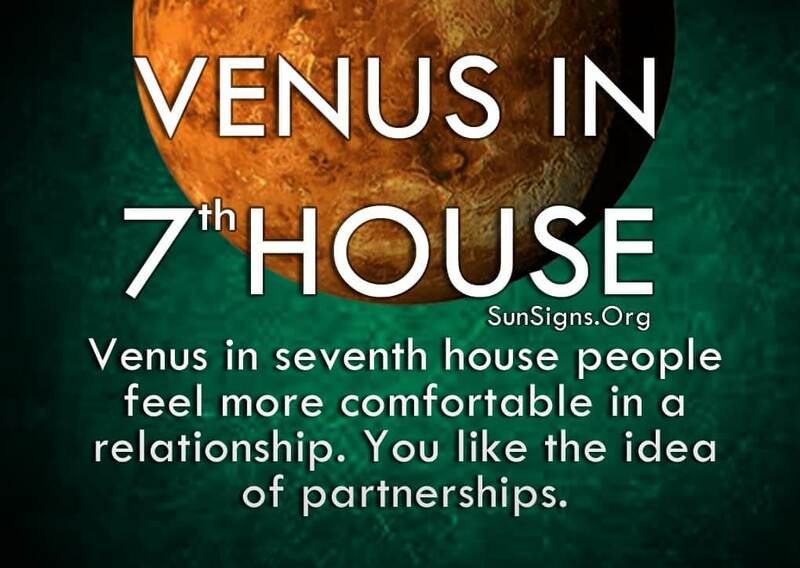 Because of your interest in balance, Venus in the seventh house feels more comfortable in a relationship. You like the idea of partnerships, which can help or hinder your search for someone. You are very accepting of different people, but may also rush into something that’s not right for you. Venus represents love, pleasure, ambition, passion, devotion and imagination. For the 7th house, most of these things come from being with another person. You don’t like to be alone, and would rather rely on another person or even a group of friends to make decisions. While you are a skilled mediator between feuding parties, and can always create a compromise, you have difficulty making decisions in your own life. Because of this, you feel stronger and more confident with someone else by your side. And you have a large social circle to choose from, because you are a social butterfly. This is expected as Libra is the ruling zodiac sign for the 7th house. The Venus in 7th house astrology predicts that as you are funny and charming, you draw people in with your flirtatious banter and attractive personality. You enjoy a lively conversation and have a lot to say, which is why you hate being on your own. You want to be engaged in some kind of social activity all the time. Because you enjoy romance and being in love, you make a wonderful and caring partner. You try very hard to maintain peace and harmony in your relationships and others appreciate your efforts. But be careful not to bend too far, or you may break under the pressure of always trying to keep things even. It takes two to balance something, so make sure your partner is holding up their end of the responsibilities. The Venus in 7th house meaning shows that you have to be careful not to pick a partner or stay in a relationship that doesn’t make you happy or enhance your life in some way. Because you don’t like to be alone you may choose to be with someone solely for that reason, having nothing to do with their personality or your feelings. This person may be very attractive but have no depth, or be nice enough but doesn’t excite you in any way. Be aware that your reasons for being in your relationship may be hurting your chances for a happy and healthy life instead of enhancing them. Take your time in choosing a partner. Get to know them before jumping into a committed relationship to ensure you truly are right for each other. You like taking a look at both sides of an issue, so do the same thing here. Figure out the pros and cons and compare the differences. The answer will appear without you having to worry about making the wrong choice. And if you still have trouble making up your mind, look to your friends for help or guidance. Don’t automatically take control of a situation if someone else feels they can handle it. Just because you are skilled at conflict resolution doesn’t mean you should jump in without consent from the people who are actually involved in the dispute. People with the Venus in the 7th house can be a bit overbearing in this regard, so take a step back and make sure everyone wants you at the table before putting on your mediator hat. But your desire to go with the flow to keep things copacetic is always appreciated by the ones you love.